This Classic Defense of orthodoxy Christianty written to counter the liberalism that arose in the early 1900’s, establishes the importance of scriptural doctrine and contrasts the teachings of liberalism and orthodoxy on God and man, the Bible, Christ, salvation, and the church. 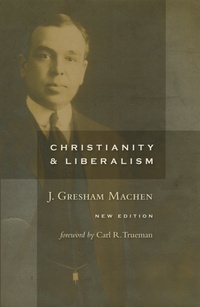 J. Gresham Machen’s Christianity and Liberalsim has remained relevant through the years ever since its original publication in 1923. It was named one of the top 100 books of the millennium by World magazine and one of the the top 100 books of the twentieth century by Christianity Today. In this book, Machen explores the key differences between liberals and biblically faithful Christians over the doctrines of God, man, Scripture, salvation, Christ, and the church, and calls the church to proclaim the biblical Gospel in all its purity.